As TSN reported, Brendan Shanahan has decided that he will not play for the New Jersey Devils this season. 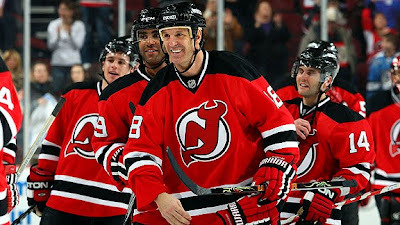 Shanny, re-signed with the Devil this off-season has reconsidered. A thanks, but no thanks kinda deal? "When I signed this past summer, Lou Lamoriello, Jacques Lemaire, and I agreed that if we were unable to find a suitable fit in which I would be able to compete and contribute at the level I expect from myself, then I would simply step aside," said Shanahan in the statement. "I have great respect for Lou, Jacques, and the entire Devils' organization. This decision is both mutual and amicable." Shanahan's statement is a bit curious, as he has not retired, but reconsidered this season. Was it the "suitable fit" with Lemaire's style of play, or his own ability "to compete and contribute" that impacted this decision? Either way, he is a sure fire HOFer with 600+ career goals and half-a-hand's worth of Stanley Cup rings (if he were a six-fingered man).